Polygons picked in the Map View can be exported in the GeoQuest/IESX (.dat or .iesx file extension), DUG’s .dupoly and Kingdom Planimeter polygon formats. For other polygons picked in the section views, the polygons can be exported using the .dupoly format. In the tree, right-click the polygon you want to export and click Export. 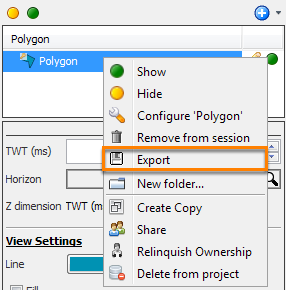 The Export Polygon window will be displayed. Select GeoQuest IESX format to save a map polygon in that format (.dat or .iesx file extension). Alternatively, select DUG Polygon to export the polygon in DUG’s .dupoly format or Kingdom Planimeter Polygon format to export the polygon to the Kingdom format. For a polygon picked in the section view, the polygon should be exported to the DUG Polygon format. Type the file name for the polygon and click Save. In the tree, select multiple polygons that you want to export. 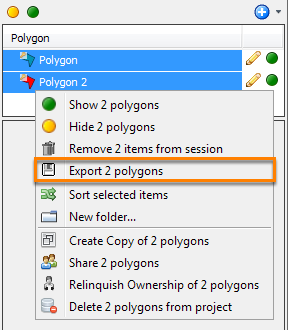 Right-click the selected polygons and click Export X polygons. If the multiple polygons to be exported are all map view polygons, the export format by default is set as GeoQuest/IESX format. However, you can still choose to export to the DUG Polygon or Kingdom Planimeter Polygon format. If the multiple polygons are made up of map view and section view polygons, the polygons should be exported to the DUG Polygon format. The same applies if all the selected polygons are section view polygons. 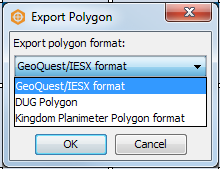 Note: The GeoQuest/IESX and Kingdom Planimeter formats only support map polygons. 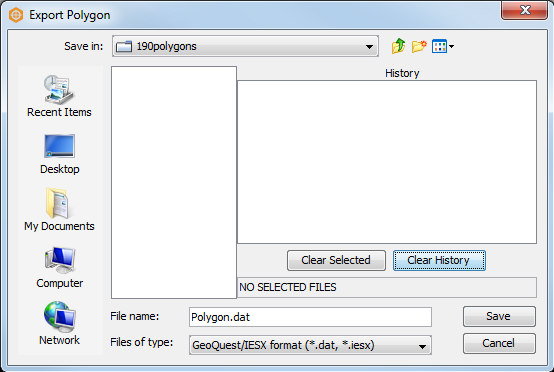 Type the file name for the multiple map polygons export in the GeoQuest/IESX format (.dat or .iesx file extension) or Kingdom Planimeter Polygon format (.dat or .plg file extension). If you are exporting multiple section and/or map view polygons to the DUG Polygon format, select the directory to save the polygons.